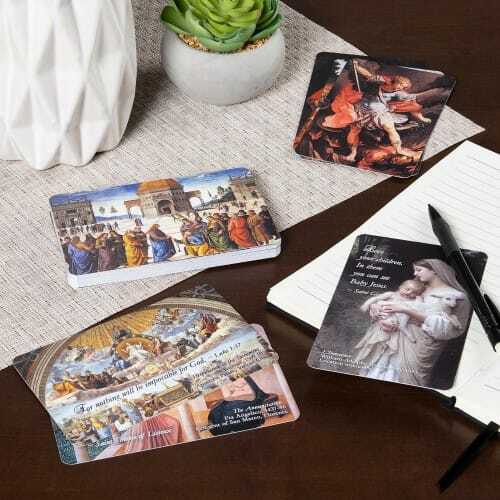 This creative card pack contains 36 well known, classical religious art pieces ranging from the 1400s to the 1950s. Each card has a full color image on the front, and on the back, an artfully faded version with a thoughtfully chosen scripture verse or saint quote. Information about the painting is also printed at the bottom. The pack includes images of Christ, the Madonna and Child, saints, and other Catholic imagery from throughout the centuries. If you love classic art but don't have time to visit all the great museums of the world, then this card pack is perfect for you! You can keep them all in one place as a coffee table display, use them as prayer cards and book marks, or distribute them all to friends and family as you feel inspired.